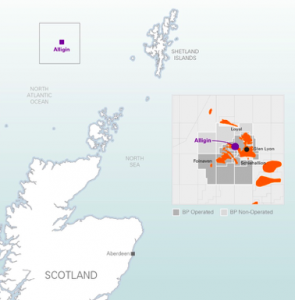 BP’s Alligin development west of Shetland has been given the go-ahead by the Oil and Gas Authority (OGA). Targeting 20 million barrels of oil equivalent, the Alligin development is expected to produce 12,000 barrels gross of oil equivalent a day at its peak. Process Industry Forum reports on this landmark North Sea development. Located 140 kilometres west of Shetland in a water depth of 475 metres, Alligin forms part of the Greater Schiehallion Area. The development will consist of two wells, which will be tied-back into the existing Schiehallion and Loyal subsea infrastructure, utilising the processing and export facilities of the Glen Lyon floating, production storage, offload (FPSO) vessel. Expected to come on stream in 2020, the Alligin development will include new subsea infrastructure, consisting of gas lift and water injection pipeline systems, and a new controls umbilical. The wells will be drilled by the Deepsea Aberdeen rig. It is part of a series of infrastructure-led subsea tie-back developments in the North Sea looking to access new production from fields located near to established producing infrastructure. This is BP’s second North Sea development approval in the past two months. Vorlich, which targets 30 million barrels of oil equivalent, received regulatory approval in September. BP’s Clair Ridge development is expected to start-up later this year. It is expected to target 640 million barrels of resources and have a peak production of 120,000 barrels of oil a day. BP also has 32% stake in the North Sea Culzean development, which is expected to supply around 5% of UK gas requirements. First gas is anticipated in 2019. Earlier this year, BP was awarded seven licences, five as operator and two as partner, in the North Sea’s 30th Offshore Licensing Round.